1. Studies in the past two decades indicate that people often understand and remember text on paper better than on a screen. Screens may inhibit comprehension by preventing people from intuitively navigating and mentally mapping long texts. 2. 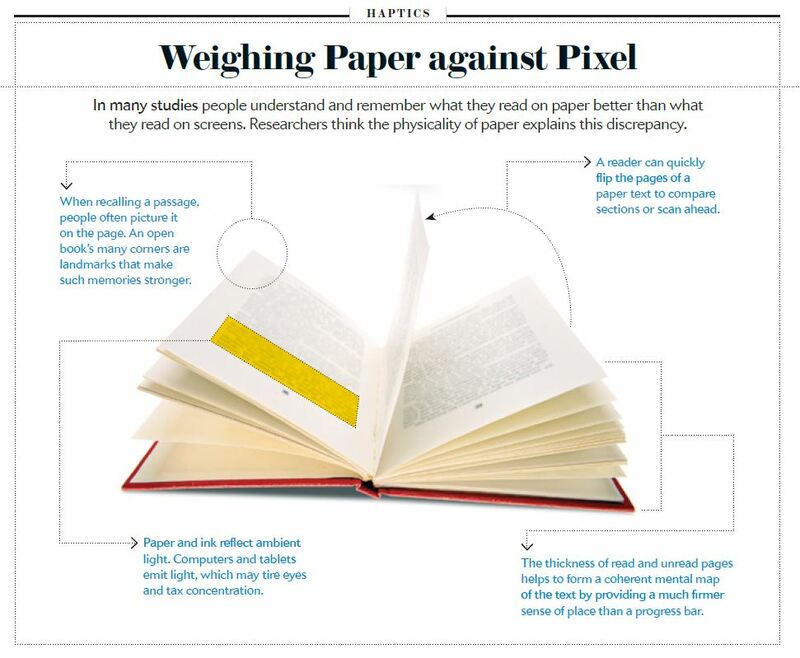 In general, screens are also more cognitively and physically taxing than paper. Scrolling demands constant conscious effort, and LCD screens on tablets and laptops can strain the eyes and cause headaches by shining light directly on people’s faces. 3. Preliminary research suggests that even so-called digital natives are more likely to recall the gist of a story when they read it on paper because enhanced e-books and e-readers themselves are too distracting. Paper’s greatest strength may be its simplicity.